Today above grounds are more complicated in some ways. The liners for example come in four different types with many colors and patterns. So, which type should you get? To help, here’s a review and some common info on the four types of liners. The original is still the best. Well, actually I’m kidding. I don’t think overlap liners are the best option for above ground pools. Overlap liners are set in the pool and then any excess liner hangs over the wall. This means you can see the liner from the outside of the pool which can be ugly. When your overlap liner is a solid blue color, it doesn’t matter much how it’s set over the wall as there is no pattern. Setting an overlap liner that has patterns printed on requires a little more effort as the pattern should be uniform at the waterline. The only advantage of overlap liners that I can think of is that they are slightly less expensive than the other kinds. By slightly less expensive, I mean like twenty bucks or so cheaper. Money can be really tight so I get why you would opt for the less expensive option. 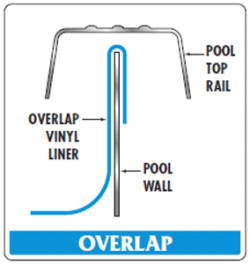 Some think to use an overlap liner for a poorly shaped pool (i.e. a pool that’s not perfectly round, because its dimensions are off). This makes it a lot more difficult to set the liner as one portion of the pool will require more liner while the opposite side will require less. Overlaps are slightly more forgiving for this as they have some extra material to work with. I will only recommend an overlap for extreme cases of poorly shaped above grounds as I can usually make the other types of liners fit as well. Some also think that they need to use an overlap liner with a pool that has a deeper center. An above ground that has a deeper bottom or a deep center will require more surface area to be covered by the liner. With its extra material, it makes sense that one would think that an overlap should be used. Again, I will only recommend using an overlap liner for this if the pool is too deep or its deep center is more than one foot down. The vinyl material used for pool liners is very forgiving and flexible so the other types of liners will also accommodate this extra surface area (but only up to one foot down). These liners are the new best way to go. I’m calling this type of liner a j-hook or unibead, because they are almost the same thing. J-hook liners have a thick piece of vinyl at the top that’s shaped like a “U”. It is designed to attach or hook to the top of the wall so the rest of the liner hangs down and covers the inside of the pool. Unibead is short for universal bead. This liner has the same U-shaped thick vinyl piece at the top of the liner, but also has a square or triangular bead of thick vinyl directly under the “U”. This unibead type is designed for both the j-hook application (as described above) and the beaded application that I’ll explain later. If you are going to use the j-hook to set the liner to the wall, you do nothing other than attach the “U” vinyl to the top of the wall. If you are using the unibead liner as a beaded liner, you’ll have to make a small cut and then tear off the U-shaped vinyl all the way around the top of the liner. It’s not hard to do as it is designed to come off. This will leave only the bead at the top and you can then proceed to use it to attach to the pool. Confused yet? Yeah, unibead liners are harder to explain. It is not so difficult, so don’t worry if you don’t get it. I recommend using unibead liners for a couple of reasons. One reason is that you can opt for a tile pattern. Tile prints make the pool look better and more like a traditional in-ground pool. Unibead liners only hang about an inch over the wall so you can’t see the liner from the outside of the pool’s wall which also looks better. I think unibead/j-hook liners are a little easier to install for the novice as they are less complicated and have a greater margin for error than the overlap or beaded types. Beaded liners for above ground pools are not my ideal choice, but they have one advantage. They are called beaded liners, because they have a thick bead of vinyl at the top of the liner. This fits into a track and then the liner hangs down and into the pool. A bead receiver or track has to be added all the way around the top of the wall so the bead of the liner has something to attach to. 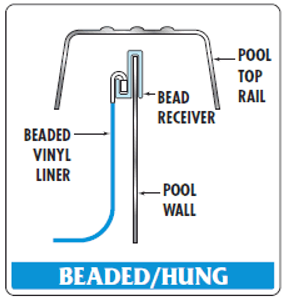 These bead tracks usually come in about four-foot pieces and very easily attach to the top of the pool’s wall. Once the bead tracks are on the wall, you can feed the bead of the liner into the channel. This is a fairly easy process, but there can be some issues. I don’t recommend using beaded liners for above grounds for two reasons. The big reason is that a beaded liner doesn’t hang all the way over the wall of the pool. This means that the pool’s water can get in between the liner and the pool wall and cause the wall to corrode. That’s not good! Another minor reason is that if the bead channel doesn’t hold the bead properly then the liner will come loose. Later when the pool is filled I’ll have to come back to resecure it in the channel. And I hate going back to fix a pool, especially if the problem weren’t my fault. Firstly, an expandable liner is not more expandable than any other type of liner as it is made with the exact same vinyl material. Expandable liners can only be overlap type liners. The only difference between it and a regular overlap is the regular overlap liner’s side piece is made with about 60” of vinyl and the expandable liner’s side is made with about 72” of material. An expandable liner is used only when an above ground pool is deeper or has a deep center that is more than one foot. The extra vinyl material is needed to make up for this added bottom area. A standard expandable liner can be used for deep centers that are up to two feet deep. There is no such thing as an expandable beaded or j-hook/unibead liner. Those would instead be what is called custom liners and would have to be made to order. And they are quite pricey. In short, I would recommend that you get the unibead liner for your above ground pool. If you want to know why, go back and read this blog post. Pattern off on bottom of pool and on top. Plus air behind wall how can we fix this?HELP. You can always call us at 877-372-6038, so we can get a little more thorough explanation of the problem. we found the leak-a tear on the bottom along the edge. The water has drained about 80% from the pool. How do we repair the liner? 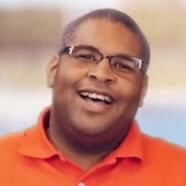 Find my blog on how to fix an above ground pool leak.. It should tell you what you need to know but you’ll probably need a new liner. Sorry to say. I am in Miami, Fl. and need to replace my liner, does any one know an installer who can do it for a reasonable price? 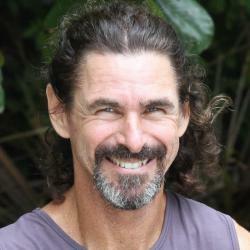 I can buy the liner from this site and gaskets (skimmer and feeder) to have everything ready. I would try sites like HomeAdvisor or Angie’s List for the most reliable reviews for local installers. Hi, I have a question, someone gave my sister an above ground pool and it needs a new liner, can she use the unibead or J-hook liners in it or is there a specific kind she’ll have to use depending on the model # or something? If she can use any kind which one would you prefer thickness and all? Thanks! In almost all cases, a j-hook type can be installed. I can’t advise beyond that with not knowing anything about the pool. And spend the extra money to get a fully printed, heavy gauge liner that is absolutely made in North America. Hi, Here’s perhaps an odd questions. I have a jug shaped water cement cistern it’s 4 ft at the top, widens to 8 ft wide and is 11 ft deep. Can I use an expandable liner for this? Do they make such a product? Would it make if there were creases? Hi. you should have no problem turning that into a body of water. You may need to have a custom liner made for it though. We are needing to replace our 24ft expandable liner we’ve had for 13 years, and looking at options. Since we have a 8 ft deep end it looks like an expandable liner is our only option? I really would like to not see the overlapping liner like we do now and possible get a pattern/print instead of just light blue. Thanks!!! You can spend the big bucks and get a custom liner with a j-hook to fit your pool. They are pricey though. There is one common expandable liner that is not just blue. Most retailers call it “Sunlight”. It has a pattern all over. Oval pools can be little tricky. Is there a specific liner type you would recommend over others for an oval pool? I always recommend a J-hook type liner for any above ground pool. Just make sure it’s made in North America. Chinese liners last only a year or two. If I have an overlap liner that needs replacing can I get a J Hook liner for a replacement? 21″ by 52″ Round. I think it’s a WIL-BAR pool. Only paperwork I could find. 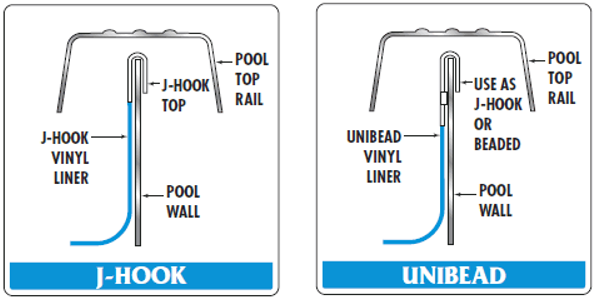 There is a 95% chance that you’ll be able to use a j-hook liner for your pool. I ordered a 54in unibead liner and I needed a 52in. Do I have to buy another one ? i have a Century pool(15 yrs.) it needs new liner. The pool store in our city put this in, and we have dealt with them for almost 30 years. (all our chemicals from them, closings, openings, etc.) they want to charge me 2000.00$ for a new liner. i can order one for about 500.00$. One with high mil and at least 10 yr. warranty on liner. Are they serious??!!. I cant justify paying that for a beaded liner, and this does not include installation. I am worried about ordering one online and then when i get it, there is something wrong with it. I dont know what i should do.?? Any suggestions? I suggest you call Inyo and talk to them. Send them pictures so they see what you have and then take it from there. If they don’t know, have them ask me and I’ll give you my opinion. It sounds though like you may need a custom liner. If you don’t, then you are being overcharged.